Brides, bridesmaids, mother of the bride/groom, sisters, aunts, groom, and groomsman! Let us help! Instead of running from salon to salon, I invite you to make Sensationails by Ruth your “One Stop” bridal boutique. Our manicure and pedicure room is cozy and private, where you will find a host of pampering services. Whether it’s a simply manicure, unique solution for less-then-perfect nails, Sensationails by Ruth is the place to be. Through years of experience with brides and bridal parties we have formulated our manicure and pedicure services to anticipate you’re every need. Offering Trind Nail Repair for the natural nail and Shellac our 14day manicure. Perfect for that extended honeymoon! Planning your wedding can be one of the most special times in your life…. unfortunately, it can also be one of the most stressful. We can pamper the bride, groom and wedding party. We get rid of the knots before you tie the knot! Sit back, relax and put yourself in our hands. 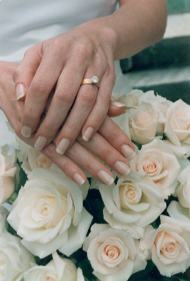 We have been taking care of brides and bridal parties for over 22 years. This is one day we enjoy almost as much as the bride!